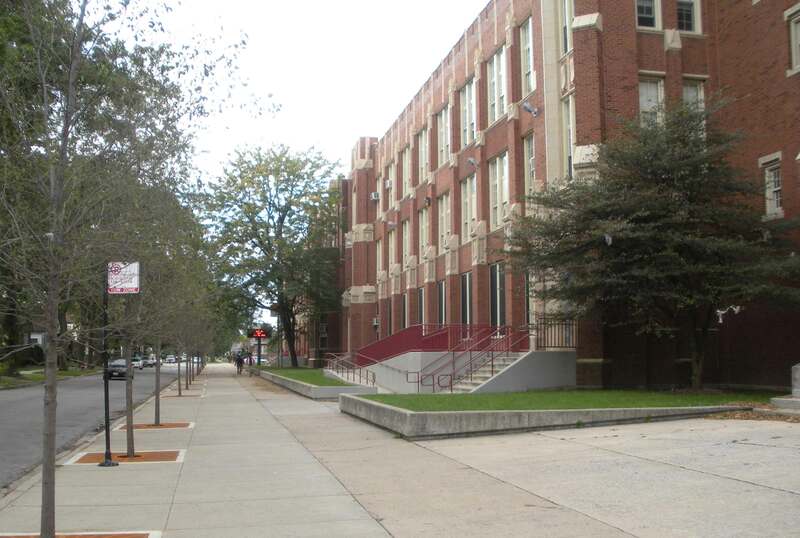 Chicago's Christian Fenger High School at 11220 S. Wallace St. during the week after the murder of Fenger junior Derrion Albert. Substance photo by George N. Schmidt.There hasn't been much mention in the coverage of the tragedy near Fenger High School of the fact that Fenger is a "turnaround" school. That means it was subjected to the Chicago Public School system's latest attack on struggling schools by dumping all the staff, even the engineers, and keeping the same students. This "reform" was after probation, restructuring, reconstitution and a host of other unsuccessful Daley-team draconian, top-down efforts. School turnarounds have turned out to be the deadliest reform of all. How could anyone expect that completely eliminating all the professionals and staff of a tough high-poverty high school could be a good thing? Contrary to popular belief, teachers and staff in schools such as Fenger and Gage Park and other neglected neighborhood high schools love their students and (usually) love their jobs. We have relationships with kids who may not even have another adult in their homes, or their lives. It's called human capital. We know brothers and sisters and, in some cases, have taught their parents. We ask them how their sick mother is or how their job search is going or whether they have met the school's community service requirement yet. We give them bus money when they have forgotten theirs. We share our lunches with those who missed breakfast. We kid them, we laugh with them, we exhort them to do better, to get to school on time, to work hard. A colleague buys suit jackets for the guys to wear to graduation. Another takes kids to get prom dresses. The list of connections and affection and love and sharing goes on and on. Oh yes, and we teach them. Yet you have to have a relationship with these kids in order to teach them. No, they are not all perfect, but most teachers would say that 90 percent of our students are great kids who want to learn. I am not saying that knowing the kids better could have averted the melee and tragic death of last week, obviously. But trouble had been brewing at the school even before last week . Staff reported a riot the previous week inside the building, involving teachers being hit, and that two different police stations had to be called in to quell the disturbance. Those are the times when the staff members draw on their relationships with kids to urge restraint, to urge calm and peace, to try to talk things out rather than fight things out. Those are the times when a seasoned staff can identify strategies and resources to address and prevent further problems. These neighborhood high schools have been underfunded, under-resourced and poorly managed. For example, CPS provides only one security guard for every 400 students! If schools need more (and they do) they have to cut into classroom funds, further disadvantaging students with larger class sizes. Our schools don't have enough social workers or psychologists to provide critically needed support for these students. Research shows that high-poverty students respond best to low class sizes, but CPS would rather invest in high-priced fancy consulting firms. One program for high school curriculum redesign, for example, costs CPS more than $31 million each year. This money goes to for-profit firms that provide books and personnel to "coach" teachers. CPS could use that money for smaller class sizes and enough qualified personnel to really make a difference, but "turnaround" has more media spin. So another poorly thought out "reform" has been implemented, this time associated with fatal consequences for one poor student and his family. It's a tragedy and a travesty. It will be in the media for a while. CPS will add security staff to Fenger for a while. Then it will be on to the next tragedy. In the meantime, if this policy continues, more schools will be turned around and more staff and students will suffer needlessly. CPS needs to look to its staff for solutions to addressing the increasingly violent world our students are living in, not continue to view us as the problem.